Is used AFTER the skin is heavily inflamed or broken. The thick consistency creates a protective barrier and defends the skin cells from pathogens and moisture. Fungus and bacteria require moisture to survive and thrive. 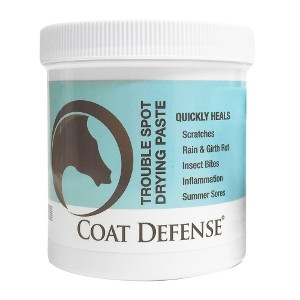 COAT DEFENSE® TROUBLE SPOT DRYING PASTE provides the skin with a dry environment to enable healing, it continuously draws out moisture, and allows the body to repair damaged cells. Acne – as an overnight mask, the drawing properties have delighted many adolescents!